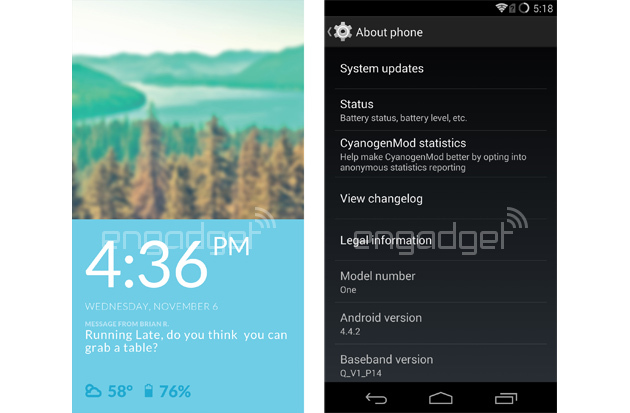 Two screenshots reportedly taken from the OnePlus One’s custom CyanogenMod OS were sent to Engadget by a “reliable tipster” and show a custom lockscreen and the About phone page. The latter is important as it shows the Model name One attached to the 4.4.2 Android version and the presence of on-screen navigation buttons. The lockscreen features a cool split-screen mode showing a wallpaper on the top (perhaps a slightly blurred version of the homescreen wallpaper) and a big clock, notification, weather and battery details. The lockscreen doesn’t have anything in common with the stock or CyanogenMod lockscreen suggesting OnePlus may have deeper customizations planted in the otherwise closely-stock CyanogenMod OS. So far we know that the OnePlus One smartphone will be unveiled on April 23 with a quad-core Krait CPU on a Snadragon 801 chipset, potent 3100 mAh battery. 5.5″ FullHD display (in a body not bigger than the Xperia Z1′s) and a Sony-made 13 MP snapper.